The Centers for Medicare and Medicaid Services (CMS) uses the Star Rating program to measure the quality of Medicare Advantage (MA) plans, publicly report plan performance, and determine quality bonus payments and rebates for MA plans. MA plans that serve a high proportion of beneficiaries who are dually enrolled in both Medicare and Medicaid have lower performance and lower MA Star Ratings, on average, than plans serving a lower proportion of these beneficiaries. However, the reasons for these disparities in performance are not completely understood. Understanding more about the types of services provided to dually enrolled or complex beneficiaries that result in high performance, as well as the costs of providing the services, is critical to informing future quality-improvement efforts in the context of value-based payment models, as well as informing the design of plans and demonstrations that seek to improve care for dually enrolled beneficiaries. 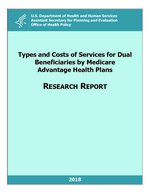 The purposes of this qualitative project were to (1) characterize the needs of dually enrolled beneficiaries and the degree to which these needs overlap with those of high-cost, high-need individuals more broadly; (2) identify the additional services that health plans and providers deliver while caring for dually enrolled Medicare beneficiaries or other high-cost, high-need beneficiaries; (3) identify the range of additional costs and resources used to deliver these services and determine whether health plans found these services to be of value; and (4) assess the available evidence on whether such services were associated with better quality and outcomes. Our first finding is that the needs of dually enrolled beneficiaries largely parallel the needs of high-cost, high-need patients more broadly. This is likely because social and medical risks are often intertwined. Our second finding is that health plans, providers, and community partners adopt a variety of strategies to meet the varied needs of dually enrolled and other high-cost, high-need beneficiaries. The activities we identified can be grouped into four categories: (1) identifying needs and data analytics to better target programs toward patients at high risk for hospitalization, readmission, and nursing home admission; (2) addressing clinical needs through care management and coordination; (3) meeting the social needs of dually enrolled beneficiaries by either referring them to existing programs that address housing, food security, and transportation needs or providing these services directly; and (4) undertaking administrative actions to better integrate Medicare and Medicaid. Our third finding is that little information is available about resources or costs required to implement and sustain these strategies, other than about the staff involved in care teams. The available information suggests that the range of costs or payments vary for each of the four types of services, depending on the plan type, approach, and type of worker providing the service. Our fourth finding is that a strong, consistent evidence base is lacking around many of the strategies described.